Could this be the Trump administration’s most outrageous act yet? The list of execrable actions taken by President Donald Trump during his first ten months in office is a long and deeply disturbing one. Even if one sticks strictly to policy actions and appointments and sets aside the President’s serial personal dishonesty and the criminal behavior in which he and multiple senior administration officials may have engaged, it’s still been a horror show. Time after time, Trump has taken action that will enfeeble and delegitimize the federal government and enrich himself and his cronies while directly harming people of modest income – many of whom, tragically, make up the core of his political base. Endorsed a series of tax policy proposals  that, together, represent one of the most blatant and egregious giveaways to the rich and to profitable corporations in American history. Amazingly, however, an action that has come to a head in just the last few days may top the list. The subject is an important and still relatively new federal agency that came to life during the Obama years (over the relentless opposition of Republicans) known as the Consumer Financial Protection Bureau (CFPB). The CFPB was established by the Dodd-Frank Wall Street Reform and Consumer Protection Act of 2010; it opened its doors as the nation’s only financial regulator completely devoted to consumer protection in July 2011, and its first Director, Richard Cordray, was confirmed in July 2013. The numbers of people protected and sums recovered from bad actors have only multiplied in the years since. Best estimates place the amount of money returned to consumers as a result of CFPB enforcement actions in the $12 billion range and the number of Americans aided at as many as one out of every eight adults in the country. The largest share of recovered funds has come from cases in which major banks have been found to have committed fraud against their customers. Simply put: Whether it’s protecting seniors victimized by scam artists, veterans plagued by debt collectors, student loan borrowers, home and auto purchasers, victims of predatory payday loans or dozens of other categories of consumers, the CFPB represents public service at its absolute best. It comes as little surprise therefore that Trump and his allies have been doing their worst to eviscerate the agency and have, in a new and troubling power play, sought, quite literally, to seize control. As multiple news agencies have reported in recent days, the CFPB’s founding director – Obama appointee Richard Cordray – resigned last Friday, several months short of the completion of his five-year term. Upon his resignation and in accordance with the original law that created the agency, Cordray’s Deputy Director, Leandra English, became the Acting Director. The law specifies that English will lead the agency until such time as a new one is appointed by the President and officially confirmed by the Senate. You got that? Not only is Trump trying to install one of his cronies (“Mick Mulvaney,” a tea partying former congressman and lending industry apologist from South Carolina who won confirmation in his current job by a razor-thin 51-49 margin) to seize control of a vital consumer protection agency, he’s attempting to do so in such a way that any semblance of independence for this vital consumer watchdog is permanently compromised. 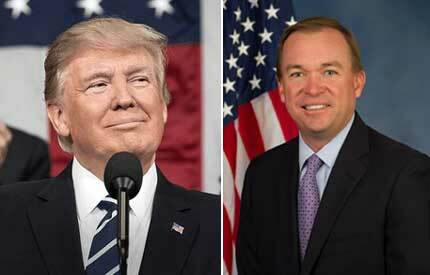 President Trump’s purported appointment of Mick Mulvaney as interim director of America’s consumer watchdog is an illegal affront to the American public. Mulvaney has said that he would like to ‘get rid of’ the consumer bureau and has called the watchdog that has returned nearly $12 billion to 29 million Americans a ‘joke…in a sad, sick kind of way.’ But it is no joke to ordinary families to attempt to defang the one agency in Washington with the tools and independence to take on the Wall Street banks, giant credit reporting agencies, and predatory lenders that abuse the American public. In keeping with the brand of lawless and morality-free governance that Trump has brought to virtually all subjects within his reach, Mulvaney simply showed up at the agency offices yesterday and claimed to be in charge. He even purported to issue an immediate freeze on all agency hiring and rulemaking. The situation is, in short, a mess of enormous proportions and emblematic of the destructive chaos that Trump has brought to so many other honorable and important public enterprises. As noted above, it is also but the latest and perhaps the most brazen in a long series of actions by Trump in which he has directly violated his supposed “promise” to “drain the swamp” in Washington and has, in effect, dammed the swamp and imported snakes and alligators to populate it. The bottom line: The matter now rests with the federal courts. Let’s hope they act swiftly to do the right thing. Given the GOP’s ongoing wrecking ball-like assault on the judiciary , however, this may an increasingly thin reed upon which to hang our hats. Stay tuned.